Press Launch: Do the younger workforce care about security? 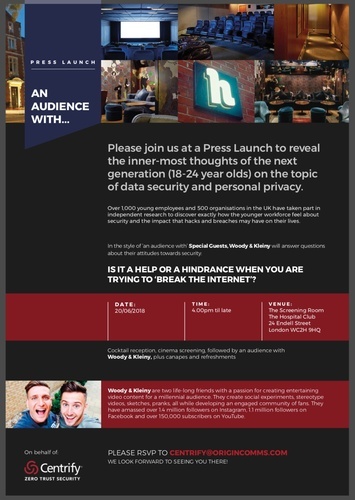 PLUS.. 'An Audience with...' Social Media Influencers on Security: help or hindrance when you're trying to break the Internet! Please join us at a Press Launch to reveal the inner-most thoughts of the next generation (18-24 year olds) on the topic of data security and personal privacy. Over 1,000 young employees and 500 organisations in the UK have taken part in independent research to discover exactly how the younger workforce feel about security and the impact that hacks and breaches may have on their lives. IS IT A HELP OR A HINDRANCE WHEN YOU ARE TRYING TO ‘BREAK THE INTERNET’? Cocktail reception, cinema screening, followed by an audience with Woody & Kleiny, plus canapes and refreshments. Woody & Kleiny are two life-long friends with a passion for creating entertaining video content for a millennial audience. They create social experiments, stereotype videos, sketches, pranks, all while developing an engaged community of fans. They have amassed over 1.4 million followers on Instagram, 1.1 million followers on Facebook and over 150,000 subscribers on YouTube. This press release was distributed by ResponseSource Press Release Wire on behalf of Origin Comms Ltd in the following categories: Children & Teenagers, Consumer Technology, Business & Finance, Education & Human Resources, Media & Marketing, Computing & Telecoms, for more information visit https://pressreleasewire.responsesource.com/about.